Observed in a marshy area north of Eldoret, Western Kenya. Oct. 2016. Also known as Intermediate Egret. Common, medium-sized, all-white wader through much of tropical Africa and Asia. The beak is yellow and the legs, often concealed below water or by vegetation, are black including the feet. 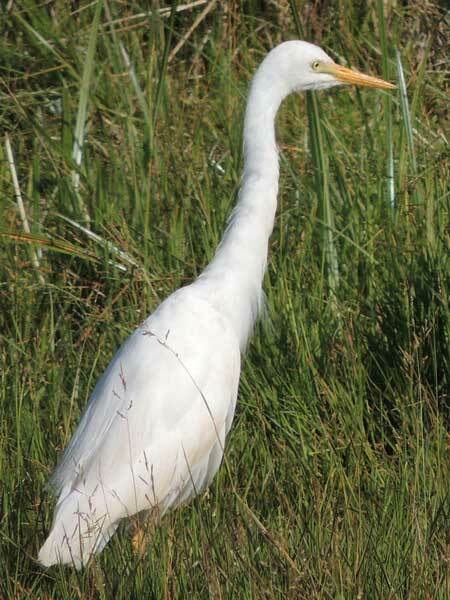 From Wikipedia: Differences from Great Egret: The non-breeding colours are similar, but the intermediate is smaller, with neck length a little less than body length, a slightly domed head, and a shorter, thicker bill. The great egret has a noticeable kink near the middle of its neck, and the top of its longer bill nearly aligns with the flat top of its head. Close up, the bare skin of the great egret's gape line extends in a dagger shape behind the eye, while the Intermediate's is less pointed and ends below the eye. The intermediate tends to stalk upright with neck extended forward. The great is more patient, often adopting a sideways-leaning "one-eyed" stance.